Bright and colorful, this is Our Lady of Copacabana. The mosaic was recently inaugurated in the Vatican Gardens. It was made in the city of Verona, Italy, by the well-known artist, Poli. In attendance were the bishops from Bolivia, who had their ad limina visit with Pope Francis this week. On December 15, Evo Morales will visit the Vatican to meet with Pope Francis for the sixth time. It will be a meeting in which dialogue will be a fundamental part. According to the Bolivian ambassador to the Holy See, who presided over the event, it will be a good opportunity to build bridges. In 2013, Evo Morales criticized and even accused Bolivian bishops of stealing. At the event, the Archbishop of Sucre downplayed this criticism. The presence of Our Lady of Copacabana in the Vatican Gardens is another example that even in the smallest State in the world, there is room for every country. 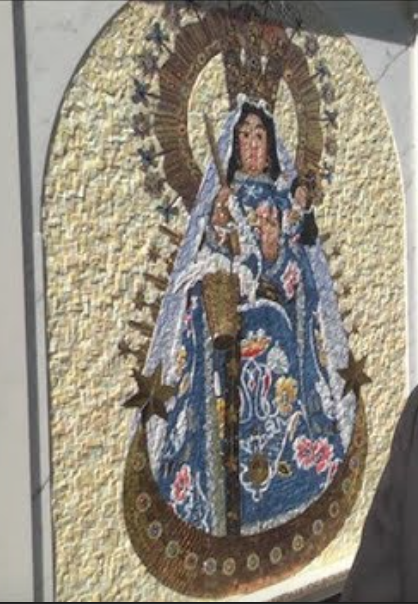 Bolivian Thoughts opinion: I am SO happy that our Virgencita de Copacabana has found a place in the Vatican! In case you don’t know about the story of Copacabana in Rio de Janeiro, Brazil, There was a Brazilian Lady that was very sick and went to pray to the Virgin of Copacabana, by the Titicaca Lake shore and got well, after praying for her health. So, when she went back to Rio, she named all her land, facing the Atlantic as Copacabana. We, Catholics are very fortunate! This entry was posted in Bolivia and tagged catholic believers, Catholic Church, Copacabana, Titicaca Lake. Bookmark the permalink.